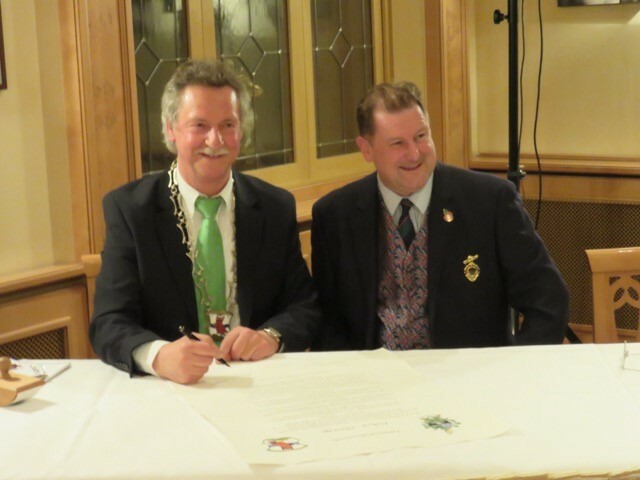 Friday March 27th 2015 saw the final stage in the twinning of Didcot and Planegg, when the twinning document was signed by the Mayor of Planegg, Heinrich Hoffman, and Didcot Town Councillor, and previous mayor, Axel Macdonald. Axel is also Chair of Didcot Twinning Association. Following the formal part of the ceremony, the nine visitors from Didcot and their German hosts were entertained with traditional Bavarian folk music and then served with a delicious meal of local specialities. There was also an opportunity to try the ‘strong beer’ that, in this area, was drunk during Lent so that the monks who brewed it could sustain their fast without going hungry. The following day we assembled in Marienplatz, in Munich, in front of the impressive Gothic Rathaus, arriving just in time for the full performance from the mechanical clock. In the ensuing guided walk around Munich’s historic centre we learnt of the rivalry between the city’s two main football clubs, the unreliability of some myths, the importance of siting your city on an important trade crossroads and how beer funds charitable works in the city. It was impossible to ignore that flags were flying at half-mast following the tragic loss of life in the Germanwings air accident. The tour ended at the Oktoberfest and Beer museum with lunch, a beer tasting and a tour of the museum. The rest of the visit followed our usual pattern of unscheduled activities, leaving time to be spent with hosts. On Sunday, some ventured into the mountains whilst others explored more cultural venues. Perhaps most surprising were the surfers on the Eisbach, a side arm of the river Isar, where an artificial wave provides hours of fun for surfers and spectators alike. All too soon the visit was over the Didcot group was on their way back to the airport and home. More interesting experiences enjoyed and more friendships formed and strengthened. Pretty much a normal twinning visit, then. Planegg and Didcot seal Town-partnership. Planegg -Planegg is now twinned with a fourth town: representatives from Planegg and English Didcot ratified the official twinning document in the Heide Volm building. The other towns twinned with Planegg are: French Meylan, Klausen in the South-Tyrol and Barenstein in Eastern Germany.A link with Didcot has already existed for two years, and reciprocal visits have already taken place. The English town sent nine representitives, headed by former mayor, town- councillor and member of the twinning-committee. Axel MacDonald. Planegg’s mayor Heinrich Hoffmann said (in English, naturally) that the official friendship with Didcot was something ‘unique’; and Planegg was now definitely ‘coupled’ with them. Meylan, which has been twinned with Didcot for many years, has for a while worked for the English to ‘come on board’. Hoffmann emphasized the importance of cultural exchange within Europe – above all, for youth. Axel MacDonald stressed in his delivery the similarities between the two communities: just as Planegg has the Max-Planck Campus in Martinsreid, so does Didcot have a thriving scientific environment. However (he said) it is not the scientific connection, but the friendship between the inhabitants of the two municipalities which is the most important factor. Author Keith BeswickPosted on April 7, 2015 Leave a comment on Planegg and Didcot seal Town-partnership. Didcot Twinning Association was formed in 1999 to promote twinning activities in the town and surrounding villages. We organise regular contacts between local residents and our twin towns. In addition we encourage societies and clubs in Didcot and surrounding areas to set up links with similar organisations in our twin towns. 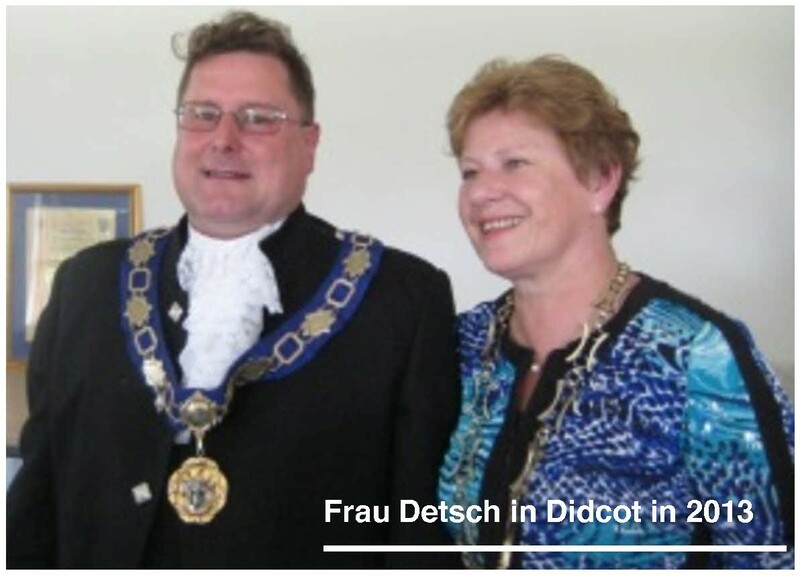 We are sad to announce the death of the Mayor of Planegg, Frau Annemarie Detsch. Many of you will recall her visit last year to sign the twinning agreement in the Civic Hall. The town of Planegg is now faced with the difficult task of electing a successor to their very popular mayor. What is a twinning visit like? If you have never been on a twinning visit and were wondering what it might be like, here are a few pointers. You will need to arrange and pay for your own travel to our twin town but usually we manage to book ourselves onto the same flights. You will be hosted free of charge by residents of our twin town. Most guest rooms seem to have their own bathroom. Normally one day is spent visiting a local attraction, as a group. This could be an historic monument, a museum or a local beauty spot. The second day might be spent doing something with your host family. This allows a more varied programme, suited to individual interests. There is often one gala dinner but other meals are taken with your host families. You don’t have to speak French or German to go along but it is appreciated if you try a few words.